The Cook-a-Palooza Experience: I Testify This Tomato Salad is "Da Bomb"
I Testify This Tomato Salad is "Da Bomb"
The weather this summer in Ontario hasn’t exactly been the best for growing vegetables. Usually by this time of year I have bright juicy red tomatoes growing in my garden ready to be picked. Instead all I have is green tomatoes waiting for warmer weather to ripen them up. Thankfully there are plenty of farmers markets around to purchase locally grown ripe and juicy tomatoes. I love to use them to make toasted tomato sandwiches. That’s why I was drawn to a tomato salad recipe I saw in the Toronto Star by Mark Bittman. What I liked about it was he used a grilled cheese sandwich to make the croutons. It also called for fresh basil which I have plenty of in my garden. I followed Mark’s suggestion and made it using tomato slices. However I think it would look more like a salad if you cut the tomato into chunks. Of course you could also incorporate the whole thing into a sandwich. Did I mention how much I love toasted tomato sandwiches? Sorry I guess I did. The versatility of this recipe reminds me of the George Clinton song "Testify". It can be cut and used in so many different ways and always be pleasing to the senses in the end. Make a crisp grilled cheese sandwich. Let it cool. Meanwhile slice tomatoes and place on a plate and season with salt and pepper. Sprinkle with chopped basil. 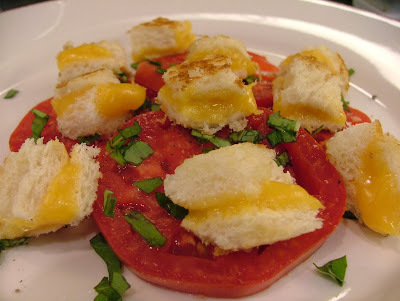 Cut grilled cheese into small cubes and toss on top.